Bharwa Baingan Recipe | Eggplant Recipes | Stuffed Brinjal : Bharwa Baingan or Stuffed brinjal is a traditional Maharashtrian dish. As we all know Maharashtrian cuisines have a very special and different kind of taste. The Process of cooking Bharwa Baingan from slitting to stuffing is so long but it worth. There are different types of brinjal, but here we are going to use the medium purple one. 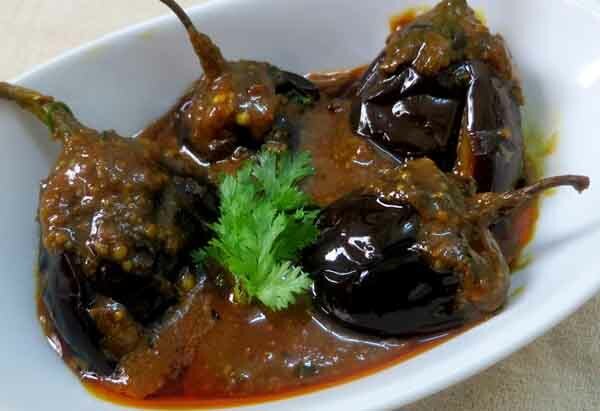 Many of us don’t like brinjal but stuffed brinjal or bharwa baigan are often good in taste. So let’s start how to cook Bharwa Baingan Recipe step by step. HOW TO MAKE Bharwa Baingan Recipe ? Rinse baingan and wipe them dry. Make a slit in the middle of baingan. Take a plate and add 1 tsp salt, 1 tsp red chili powder, 2 tsp coriander powder, 1/2 tsp turmeric powder and 1 tsp fennel seeds to it. Now start filling the stuffing in baingan. Add 1 tsp cumin seeds, 1 tsp fennel seeds and 1/4 tsp asafoetida and let them sizzle. Add stuffed baingan to it and simmer it for 15-20 minutes on medium flame. Add leftover masala to the pan. When baingan get tender, sprinkle 1/2 tsp of dry mango powder/ amchur on it. Preparation: Take 1/2 kg fresh brinjals. Rinse baingan and wipe them dry. Make a slit in the middle of baingan. Put the baingans in a bowl full of water so that it will not change it color. Keep it aside until required. You can chop 2 onions if you want. Prepare The Stuffing: Take a plate and add 1 tsp of salt, 1 tsp of red chili powder, 2 tsp of coriander powder, 1/2 tsp of turmeric powder and 1 tsp of fennel seeds to it. Mix it well so that each and every ingredient get mix evenly. If you are adding onions then.take a pan and roast the mixture. Add 1 tbsp oil to it and heat it. Add cumin seeds, asafoetida and fennel seeds and allow them to sizzle. Add finely chopped onions. And add all the masala to the pan and sauté for 4-5 minutes. Add 2 tbsp of water to the pan just to bind the ingredients well. Turn off the flame and let it cool. Fill The Stuffing in Baingan (Brinjal): Now our mixture is ready. Take out the baingan (brinjal) from the water. Wipe them dry and fill the mixture in to the slits of baingan (brinjal) one by one gently. Keep it aside until required. Cook the Baingan (Brinjal): Take a pan and add 2 tbsp oil/clarified butter to it. Heat it and add 1 tsp of cumin seeds, 1 tsp of fennel seeds (saunf) and 1/4 tsp asafoetida (hing) and let them sizzle. Add stuffed baingan (brinjal) to the pan and simmer it for 15-20 minutes on medium flame until. Add leftover mixture to the pan and add finely chopped coriander leaves. You can also make stuffed baingan (brinjal) in microwave if you are health conscious. When it cooked from one side, toss it and cook it from another side. Add 1/2 cup of water if needed. When baingan (brinjal) get tender, sprinkle 1/2 tsp of dry mango powder/ amchur on it. Take (Dried Kasoori Methi) fenugreek leaves and rub it on hand and spread it on the baingan (brinjal). Mix it well and simmer it for 4-5 minutes. When it cooked from all the side take out the stuffed baingan (brinjal) from the pan. Switch off the flame. Stored Upto: After Cooling, you can store remaining stuffed baingan (brinjal) in refrigerator and eat whenever you want, upto 5-6 days. Garnishing: Garnish it with finely chopped coriander leaves and you can also add 1 tsp lemon juice if you want. Serve it with chapatis/naan. Enjoy this Indian Classic Bharwa dish – Bharwa baingan (stuffed brinjal). Use fresh spice powders that makes the dish very fragrant. If you are a dry-fruit lover, add them also.